When this spell comes into play, place 3 status tokens on it. Discard this spell when it no longer has any status tokens on it. When your Phoenixborn would receive damage, you may remove any number of status tokens from this spell. 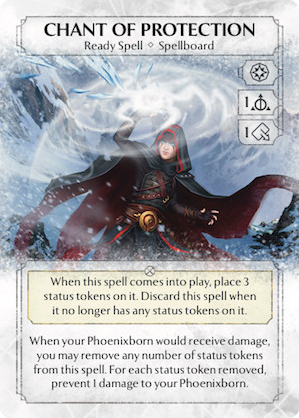 For each status token removed, prevent 1 damage to your Phoenixborn. I've been finding this card has some extra life (Ha!) in PB with a spellboard of 5 (Dimona and Coal), since you can treat it like an Action spell with a parking spot and it doesn't take space from your core 4 Ready spells. You can draw into these 'impermenent' ready spells (chant of the dead, law of assurance, law of sight, law of fear) and since they 'expire', you can overclock a bit. Plus Coal and Dimona are squishy, so Chant of Protection can keep you in it for another round. Thoughts?